Cooking my food in bulk has just become a part of my life, it makes it easy during the week when I am busy with other things and don’t feel like cooking. 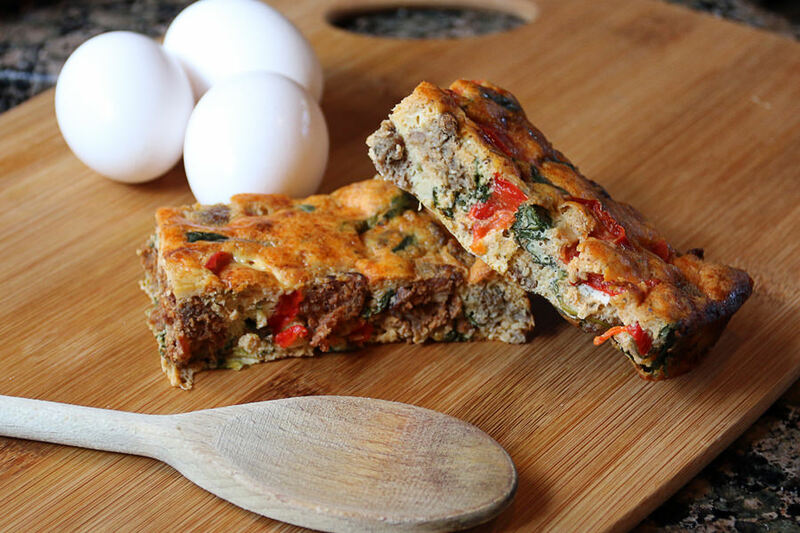 Let me know what you think of the recipe in the comments – and let me know what tweaks you make to make it even better! 1. Put 1 Tbsp. Olive Oil into a pan and let it heat up. Add your spinach and let it cook down. 2. 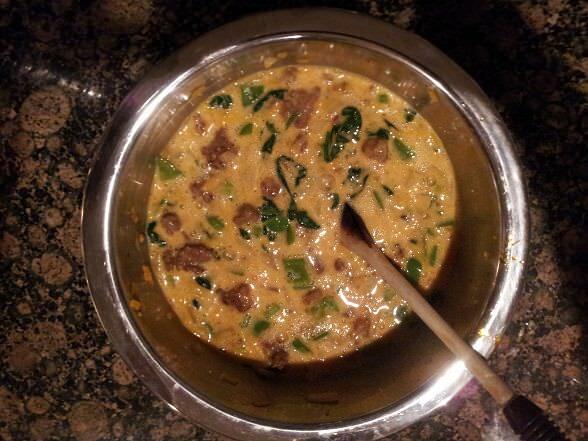 While the spinach is cooking, find a large measuring cup or container, and crack 12 eggs into it. Add your 8 Tbsp. heavy cream to this and mix well. Once you have mixed this, add your garlic powder, pepper, and salt. Mix again. 3. 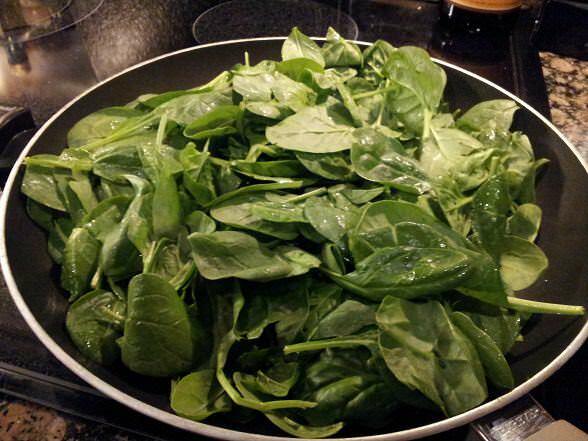 Once your spinach has cooked down, put it into a large mixing bowl. 4. Start cooking your chorizo and italian sausage. 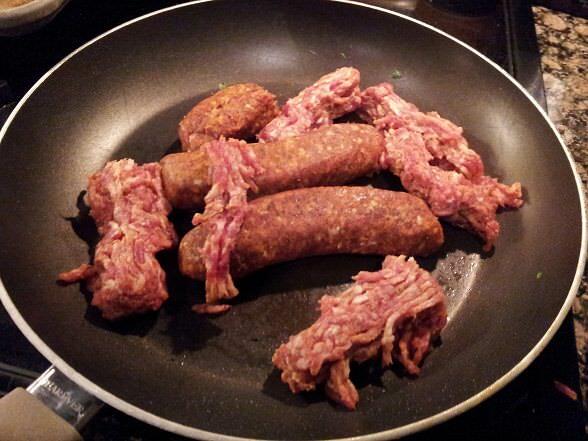 I had to skin my chorizo sausages beforehand so I could break down the meat as much as possible as it cooked. Also preheat your oven to 350 degrees as you start to cook the meat. 5. 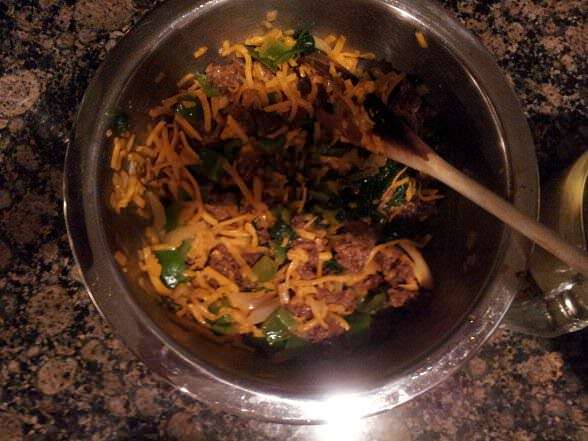 Once you are happy with how broken down it is, transfer the chorizo and italian sausage to the mixing bowl with the spinach. 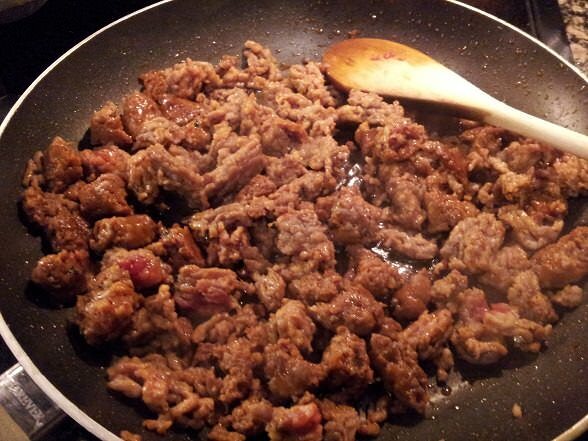 Keep as much of the fat in the pan as you can. 6. 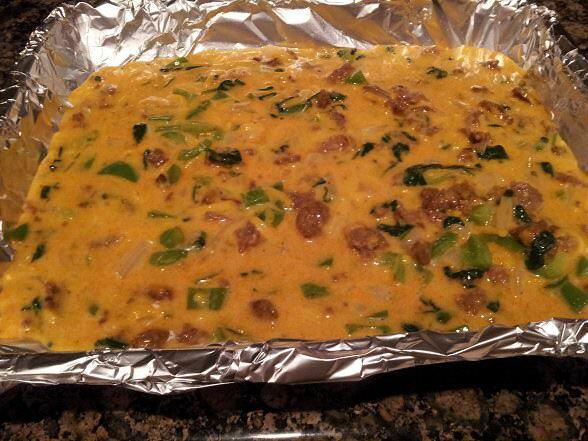 Add your chopped onion and pepper to the pan, letting it cook in the chorizo and sausage fat. 7. Once it’s finished, also add these to your mixing bowl. 8. 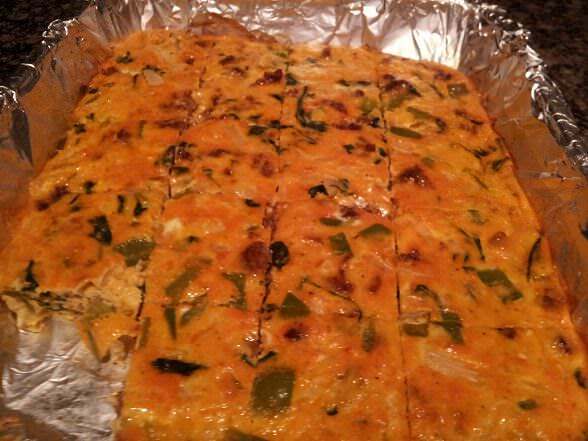 Add your cheddar cheese ontop of everything, and give it a small mix – this will melt the cheese a little bit. 9. 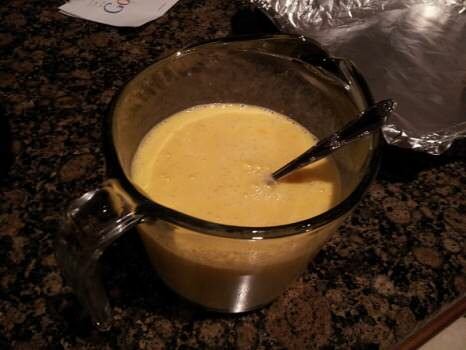 Add your egg mixture and mix everything up well. You want an even distribution of the ingredients. 10. 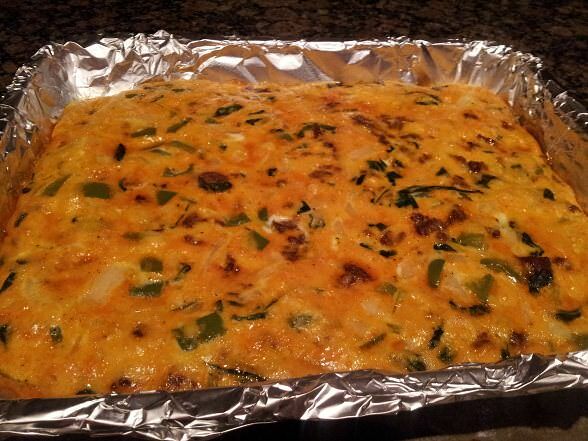 Put your mixture into a cooking pan, foiled and buttered up. 11. Put it into the oven at 350 degrees for about 45 minutes. 12. If you run a knife through it, it will come out clean and have some texture to it now. Go ahead and take it out of the oven. 13. Cut into 20 slices, and eat as you need. I keep them in the fridge for about 4 days and eat them as snacks or as breakfast. This will make 20 total “pieces” and each piece breaks down to be: 209.7 Calories, 16.93g Fat, 1.99 Net Carb, and 11.93g Protein. If you need to cut the calories, I suggest adding less cheese – but I just love the stuff! This will make 20 total "pieces" and each piece breaks down to be: 209.7 Calories, 16.93g Fat, 1.99 Net Carb, and 11.93g Protein. If you need to cut the calories, I suggest adding less cheese - but I just love the stuff! Heat 1 tbsp olive oil in a pan. Add spinach and let it cook down. While the spinach cooks, crack 12 eggs into a large measuring cup or bowl. Add 8 tbsp heavy cream and spices. Mix well. 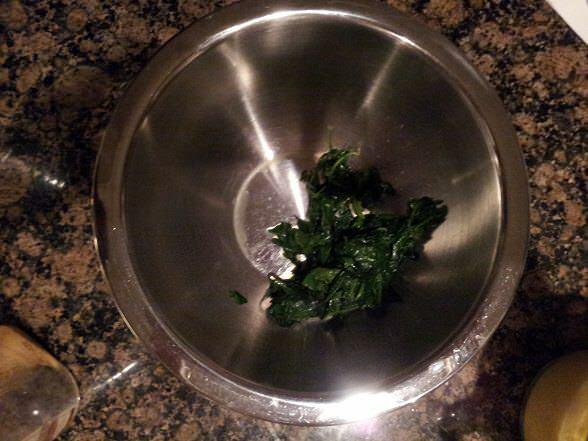 Put the fully cooked spinach into a large bowl. Start cooking your chorizo and Italian sausages. While cooking, preheat oven to 350 F.
Once the sausage has broken down to your liking, transfer it to the bowl with the spinach, making sure to keep as much fat in the pan as possible. 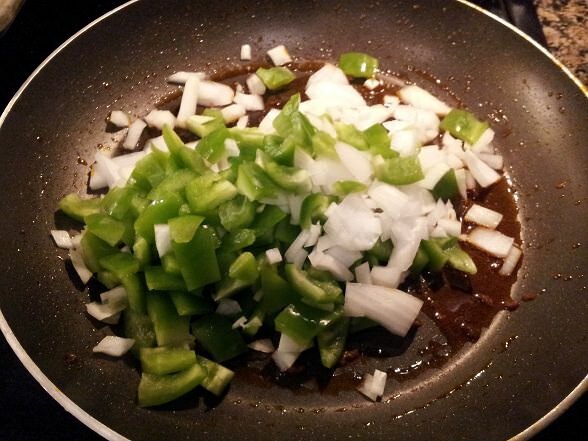 Add chopped onion and pepper to the pan, cooking it in the sausage fat. Add to mixing bowl once done. 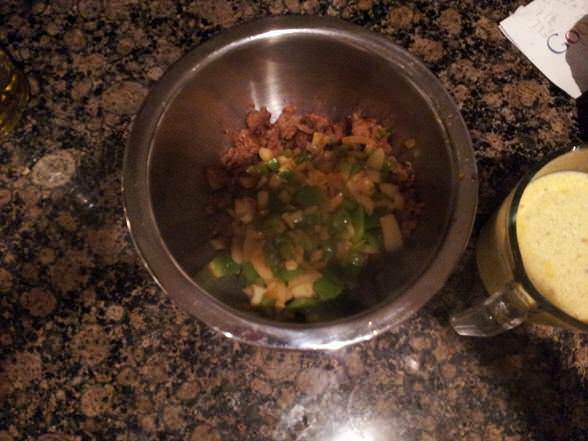 Add the cheese to the bowl and mix lightly. 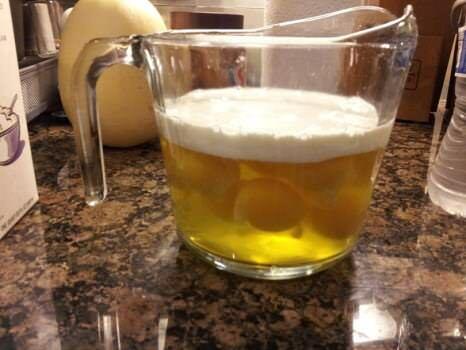 Add the beaten eggs and mix well, making sure to distribute everything evenly. Put your mixture into a pan, foiled and buttered. Bake for 45 minutes at 350 degrees F. You should be able to run a knife through cleanly when this is done.